Parents know he is not real, yet they tell their children he’s alive and well and goes from house to house at Christmas Eve bringing glad tidings and gifts, especially toys – the very things that children love. We live in a world where we try to make Santa Claus as real as possible. We even have provided him with a mate – Mrs. Claus. Even NORAD, the North American Aerospace Defense Command add its bit each year to allow our children to believe the man behind the red is a real person. Since 1955, every Christmas Eve, NORAD purportedly uses its available technology to track Santa Claus as he leaves the North Pole and delivers presents to children worldwide. He must be the only person who can cover the globe in those few hours. The man in red is made out to be omnipresent; a title that only belongs to YAHWEH. Who really is this man behind the red suit? What does he have to do with the so-called birth of Christ? Why does he occupy such a place in the Christmas celebrations that borders on idolatry? I recall reading a survey some time ago where children were asked who’s the first person that comes to mind when they think of Christmas. Make a guess. Santa, of course. The man in red! I’m wondering why Christmas can’t be changed to another name. Perhaps Santamania, Santafest, or even Santamas. After all, he has taken over as the central figure of the holiday. The origins of Santa Claus can be traced back hundreds of years to a monk named St. Nicholas, who was born about 280 A.D. in Patara, near Myra in modern-day Turkey. St. Nicholas was much admired for his piety and kindness, and became the subject of many legends. The name Santa Claus evolved from Nick’s Dutch nickname, Sinter Klaas, a shortened form of Sint Nikolaas (Dutch for Saint Nicholas). Regardless of his legendary origins, what he’s made out to be today has fast outgrown his initial status in that corner of the world, where he was said to be born. Over the years, he has been adorned with the unusual characteristics – from worming himself down the chimney to bring gifts even on the stormy and snowy nights at Christmas Eve, to even leaving out those unfortunate children who might not have been living at the right home and at the right time. 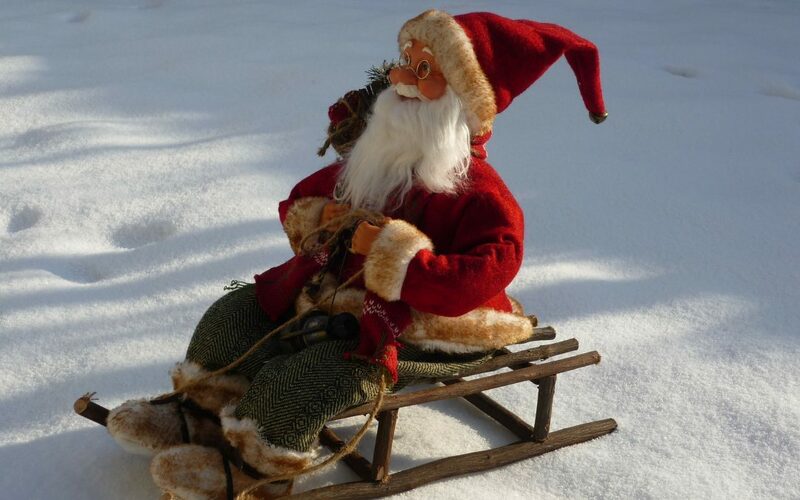 Santa does not take a plane; he flies in mid-air on a sleigh driven by spirit-like reindeers. Santa does not eat, hardly anyone sees him eating, sleeping or performing the normal routine of a human being in his daily walk of life. Santa cannot be normal. If he flies, is almost everywhere at the same time, does not eat food or meet other physical needs, he cannot be a normal person. There should be a frightening message in that for Christians who celebrate Christmas (not all of them do). That is exactly what our loving and “sincere” parents make Santa out to be to their beloved children. “Yes, Virginia, there is a Santa Claus.” Santa is for the children, they argue. It’s just fun…they know he’s not real…they know better, and the excuses go on and on. At the same time, these very parents go out of their way to make him very real. Whether it’s having them take pictures on Santa’s lap, pictures of Santa everywhere – in the house, on presents, toys, and you name it. No to mention the commercial aspect of it, where this ubiquitous character is all over the stores and dazzle your eyes with every turn in the malls, inside and outside. Is it any wonder, our poor little children are so confused many of the time about right from wrong, truth from lie. Since when is it okay to lie? It’s obvious Christ was not born on December 25th; that’s the first lie; equally so, there is no Santa Claus, another lie. If we feed our children lies, can we expect them to know truth? Surely, they become adults and look back at the lie, and it’s no wonder, too, some have been joining the growing number of agnostics and atheists because God makes no sense to them. The Christmas-Santa Claus story was not true, hence its’s easy to dismiss God as not real either. Maybe it’s time to stop calling the holiday Christmas because the man in red has stolen “the show.” For more on this subject, download FREE our booklet, FACTS YOU SHOULD KNOW ABOUT CHRISTMAS.